NEW YORK (CNN) -- An expert on Lincoln photography thinks a photograph found in Gen. Ulysses S. Grant's family-owned album showing President Abraham Lincoln in front of the White House could be one of the last photos taken of the 16th president before he was assassinated in 1865. A photo found in Gen. Ulysses S. Grant's family album is verified to contain an image of Abraham Lincoln. Grant's great-great grandson Ulysses S. Grant VI had seen the previously unpublished image in the general's personal photo album, but didn't think much of it until he scrutinized it earlier this year. "I started to think that it might be the White House," said Grant, a construction business owner from Springfield, Missouri. "Then I started to look at the height difference between the people in the photo." 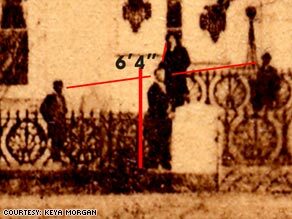 Thinking that the towering individual commanding the attention of the other people in the image could be Lincoln -- who stood 6-foot-4 and is the nation's tallest president -- Grant called Keya Morgan, a renowned collector and scholar of Lincoln and Gen. Grant photographs, to see whether his suspicions could be verified. Morgan, who owns the world's largest collection of Lincoln artifacts and original photographs, persuaded Grant to take the small photo out of the album to see whether any clues could be found on the back -- particularly the name of the photographer. "If you don't know who the photographer is, it's like not knowing who your father and mother are," Morgan said. According to Morgan -- who cites Lincoln's secretaries John Hay and John Nicolay -- Warren took the last three photographs of Lincoln on March 6, 1865, just two days after his second inauguration. Morgan says Warren was desperate to take pictures of Lincoln, so he staged the first act of paparazzi photography. According to Morgan, Warren first took photos of the president's son Tad on his pony. The following day, Warren gave the pictures to Tad and told him to summon his father. Morgan says that Warren was already set up to take the photo outside the White House, and that Lincoln gave him access afterward to take two more portraits on the White House balcony. Will Stapp, founding curator of the National Portrait Gallery's photography department and a professional photograph appraiser, agrees with Morgan's assessment of the long-lost image. "The figure itself, the physique -- in looking at it under a magnifying glass, I can see the shape of his beard; I can see the hairline," Stapp told CNN. "It's similar to the impression you get from other photos taken of [Lincoln] from the same distance, like at the Gettysburg Address and his inauguration." Stapp and Morgan also say it appears that Lincoln is wearing the same clothes in the outdoor photo as he wore for the portraits taken the same day. As one of only 130 photographs of Lincoln, it is an extraordinary find not only because of its proximity to Lincoln's death, but because it shows him in a natural stance. "You could put yourself in the shoes of the people around [Lincoln] and see what it was like to live at the White House," said Morgan, who says he receives 10 to 20 requests a day asking him to verify potential Lincoln photographs. Morgan, who purchased the photo from Grant, says he has received thousands of e-mails from Lincoln aficionados commenting on the find. His Web site, lincolnimages.com, received more than 5 million hits on Tuesday and crashed because of the traffic overload.